In the distance is Saltley Junction Signal Box whilst in the foreground are the lines forming the throat to Saltley sidings. 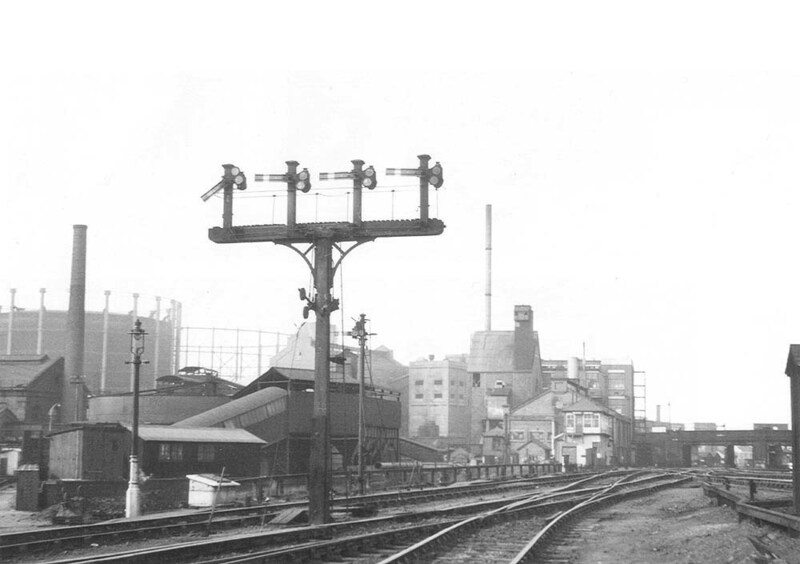 Behind the four arm lower quadrant Midland Railway signal gantry is part of the City Gas Works which were a separate facility to Saltley Gas works which were located out of sight and immediately to the right of the photographer. To the left of the gantry is a sandbox used to supplement the sand carried on locomotives. As can be seen from the photograph, there was a slight slope down from the junction between the main lines and the sidings. In damp and cold weather conditions the rails would become greasy and the locomotive could slip trying to lift its train from the siding. The sand from sandbox would be placed on a length of the rails to help provide adhesion for the locomotive exiting the sidings.